Determine what type of research opportunity you are seeking. There are many ways to get involved in undergraduate research; you may do research for course credit, as an internship, for pay, or as a volunteer. Think about what may work best for you. Think about what chemistry classes and labs you’ve particularly enjoyed. Was the content of the class/lab more chemical biology, inorganic, chemical education, analytical, organic, materials, physical/theoretical, or environmental? Search around to learn about what other people are researching. Look online or look specifically at the research being conducted in the Chemistry Department. Attend departmental and university research forums and seminars to get an idea of what research is possible. Talk to your fellow classmates, your TAs, and your professors. Identify faculty members that you want to work with. After you decide what type of chemistry interests you, browse the faculty listings at chem.wisc.edu and identify four or five professors who are doing projects you would like to work on. That said, sometimes professors aren’t able to take research students due to insufficient funding, limited lab space, limited personnel/mentors, etc. Don’t take this rejection personally, stay flexible and just move on to your next choice. Click here for hints on how to write a good letter. Fill out an Undergraduate Research Form (pdf) and return it to the Undergraduate Research Office, Chemistry Room 2110 . Once you have found a research adviser, fill out the chemistry research authorization form. This form must be completed, signed by both you and your lab mentor, and returned to the Undergraduate Research Office every semester you are conducting research for class credit, pay, or as a volunteer. The hardest part of getting involved in research is usually finding a research mentor. Some students may be lucky and find a research mentor immediately. 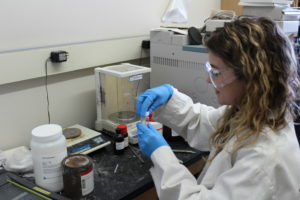 Most students, however, may need to contact several people multiple times before finding a research lab that is taking undergraduate students. Don’t get discouraged though — although getting involved in research can be the most valuable experience in your scientific career, it also takes commitment and a lot of patience. If you are having a hard time finding an advisor or would like additional information regarding undergraduate research, please schedule an appointment with Dr. Cheri Barta, Undergraduate Research Director, or visit the Undergraduate Research FAQ web page. If you plan to come to Office Hours or schedule a meeting, please fill out the following form to let us know more about you and your research interests (Get Started – Meetings).